100% organic. Made from nature's best nuts. Great taste 2016. BPA free bottles. Pure pink water from young green coconuts. We're one of a kind (like you) so look and taste might vary. Good source of potassium. Suitable for vegans, gluten avoiders & electrolyte seekers.Coconut Water the way it should be. Pure, pink and sustainably sourced. 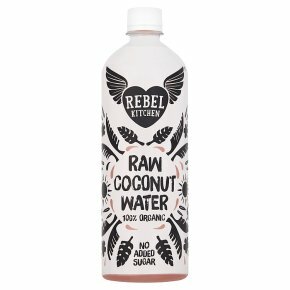 Rebel Kitchen Coconut Water is made from organic young green coconuts sustainably sourced from local farmers in the Philippines. Our coconut water contains antioxidants, that's why it turns pink. Simple.